How to Use WEEKDAY in Excel? 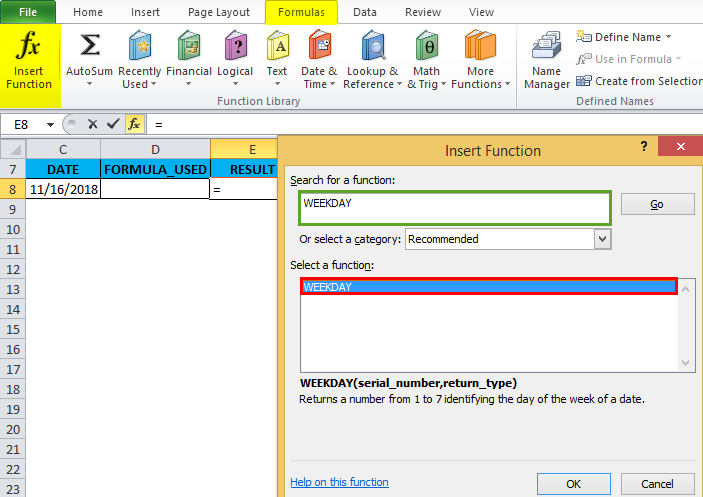 WEEKDAY Function: It’s an in-built function in excel that is categorized under DATE & TIME function. It is used as worksheet & VBA function in excel. It is used as a part of a formula in a cell of a worksheet & also integrated with other complex excel time & date functions and other excel formulas. Excel considers Sunday as the first day of the week by default, not Monday. Its most commonly used by a financial & statistical analyst to calculate project completion time (excluding weekends) & helpful in scheduling & planning the work for company projects. WEEKDAY Function returns a numeric or integer value from 1 to 7 that corresponds to the day of the week. return_type: a return type is a number from 1 to 7 that identifies the day of the week of the date. It will help out which day to use as the first day of the week for calculations. It provides a list so that you can choose how you would like the number to be returned. e.g. Sunday = 1 to Saturday = 7, or Monday = 1 to Sunday = 7. It is an optional parameter or argument if it is vomited, weekday function considers as 1 by default, the first day of the week is considered Sunday. How to Use WEEKDAY Function in Excel? This WEEKDAY Function is very simple easy to use. 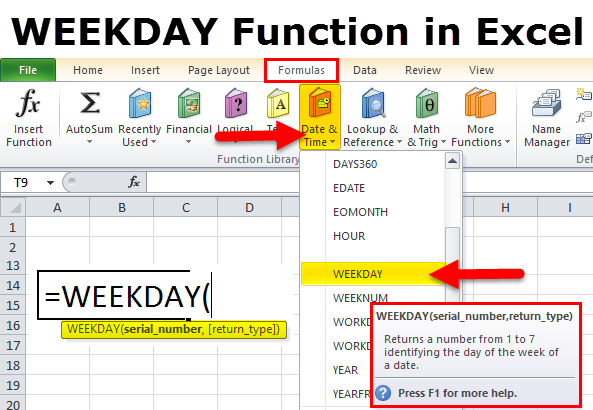 Let us now see how to use the WEEKDAY Function in Excel with the help of some examples. Prior to applying weekday function, if the “E8” cell is in date format, we have to convert that cell format into the general format. Let’s apply WEEKDAY Function in cell “E8”. Select the cell “E8” where weekday function needs to be applied, Click the insert function button (fx) under formula toolbar, a dialog box will appear, Type the keyword “WEEKDAY” in the search for a function box, WEEKDAY Function will appear in select a Function box. In the “E8” CELL, WEEKDAY Function returns the day of the week corresponding to November 16th, 2018 i.e. 6. Usually, WEEKDAY Function in Excel returns the value or output as a serial number. The value represents the date. It is a compulsory argument. The given serial_number argument is numeric but it is out of range for the currently existing database. The given return_type argument is not one of the permitted values (11-17 or 1-3). Dates should not be directly entered into the argument, because it interprets text representation of the date differently. Therefore it is better to use cell reference instead of entering the date directly. 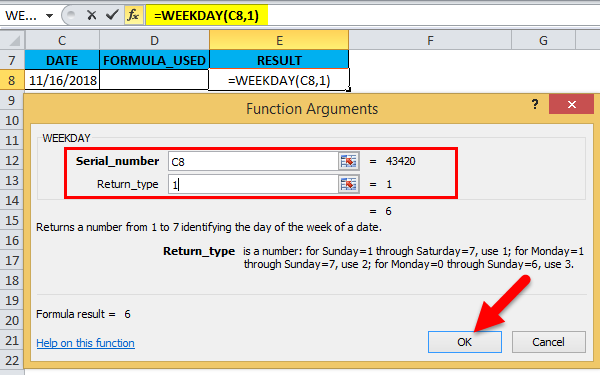 In the weekday function, if the return_type argument is mentioned 1 or its vomited or the value not entered, then by default, the first day of the week is considered Sunday.